SUBHEAD: Coal-loving Wyoming legislators are pushing a bill to outlaw wind and solar. 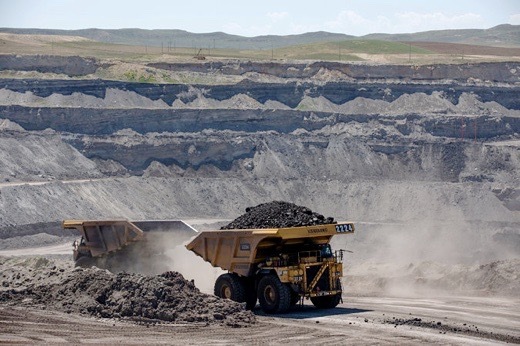 Image above: The Eagle Butte coal mine outside Gillette, Wyoming is operated by Alpha Coal West Inc. and is one of about a dozen mines in the Gillette area. From (https://www.nytimes.com/2016/06/20/us/as-wind-power-lifts-wyomings-fortunes-coal-miners-are-left-in-the-dust.html). On the first day of the state’s legislative session, nine Republican lawmakers filed legislation that would bar utilities from using electricity produced by large-scale renewable energy projects. The bill, whose sponsors are primarily from the state’s top coal-producing counties, would require utilities to use only approved energy sources like coal, natural gas, nuclear power, hydroelectric, and oil. While individual homeowners and small businesses could still use rooftop solar or backyard wind, utilities would face steep fines if they served up clean energy. Wyoming is the nation’s largest producer of coal, and gets nearly 90 percent of its electricity from coal, but it also has huge, largely untapped wind potential. Currently, one of the nation’s largest wind farms is under construction there, but most of the energy will be sold outside Wyoming. Under this bill, such out-of-state sales could continue, yet the measure would nonetheless have a dampening effect on the state’s nascent renewable energy industry. Experts are skeptical that the bill will pass, even in dark-red Wyoming, InsideClimate News reports. One of the sponsors, Rep. Scott Clem, is a flat-out climate change denier whose website showcases a video arguing that burning fossil fuels has improved the environment.